Bradenton Country Club has reopened after being closed for restoration Since April 15. The iconic Ryder Cup captain Tony Jacklin CBE and Brian Lake, Director of Golf and PGA Professional led the upgrade project. The renovation includes some raised fairways to prevent flooding, improved playability and ease of maintenance while returning the course to its brilliant Donald Ross design. As part of the upgrade, Bradenton Country club is now offering its golfers a sophisticated way of returning their golf clubs to past glory as well. 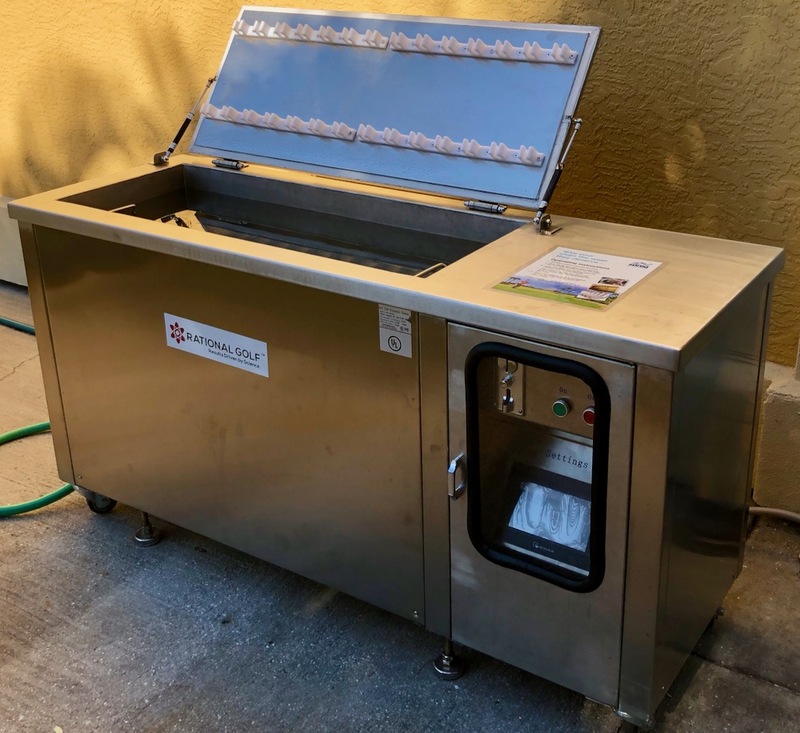 An ultrasonic golf club cleaning machine provided by Rational Golf LLC of Bradenton restores the clubs. Golf clubs are cleaned by millions of imploding gas bubbles removing dirt at a microscopic level, giving your clubs that new feel. Bradenton Country Club has its own club fitting studio operated by Brian Lake. Brian is trained in the revolutionary BioMatch method of matching golf clubs. The BioMatch algorithm creates a model of the golfer swinging each of his or her clubs and thereby determines the optimum weight of each club. The target weight is achieved by adding a specific proprietary weight inside the shaft at the grip end of each club. The method provides significantly better accuracy to golfers at all levels. 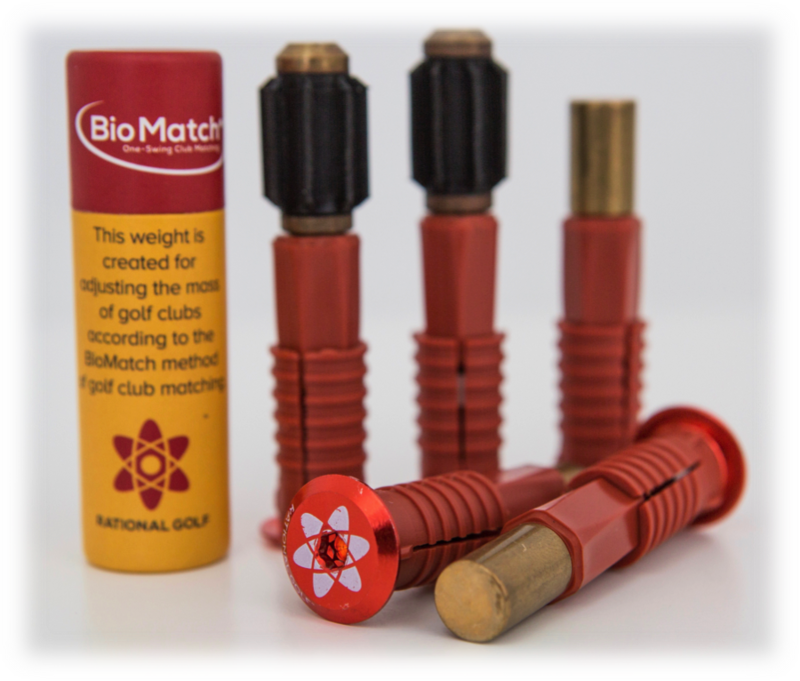 BioMatch offers an effortless improvement to any golfer’s game. The process applies to any set of clubs, old or new. You can learn more about the technology at www.rational-golf.com. If you want to be among the first to play the refurbished course, you may want to join the Manatee Chamber of Commerce annual golf tournament on Friday, December 7. See more information online at manateechamber.com/golf. 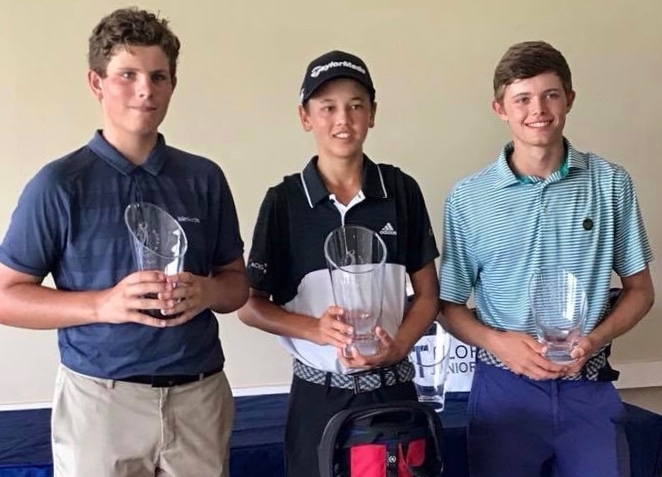 Gregory Solhaug, a 15-year-old student at the IMG Golf Academy in Bradenton won the Florida Junior Tour (FJT) organized by the Florida State Golf Association (FSGA) at Wyndemere Country Club in Naples this weekend. 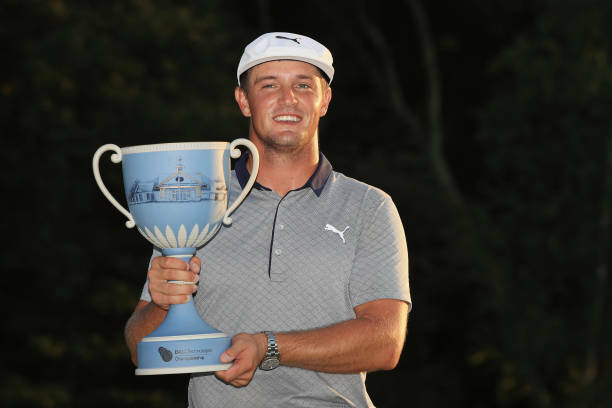 He shot a total of 4 under par after two days of tournament and won by 5 shots. Tiago Barni (on the left) finished in second place. Rounding out the top three was Leo Goosen (on the right). Gregory is one of several players at the IMG Golf Academy that is taking advantage of the BioMatch one-swing golf club matching system. Gregory was the only player in the 45 strong field that has his clubs matched. The BioMatch system is available to all at www.rational-golf.com. 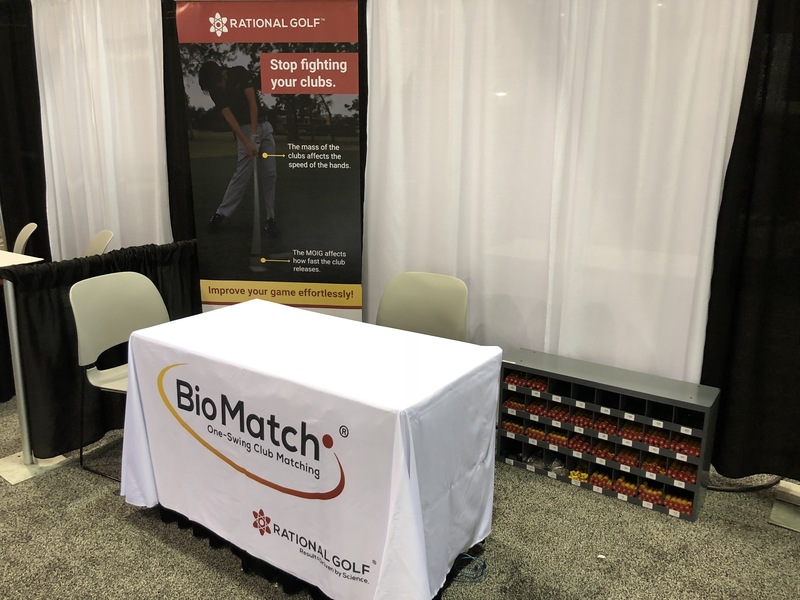 BioMatch was introduced to the Scientific Golf Community last week at the 2018 World Scientific Conference of Golf held at the University of the Fraser Valley in Abbotsford, Canada. 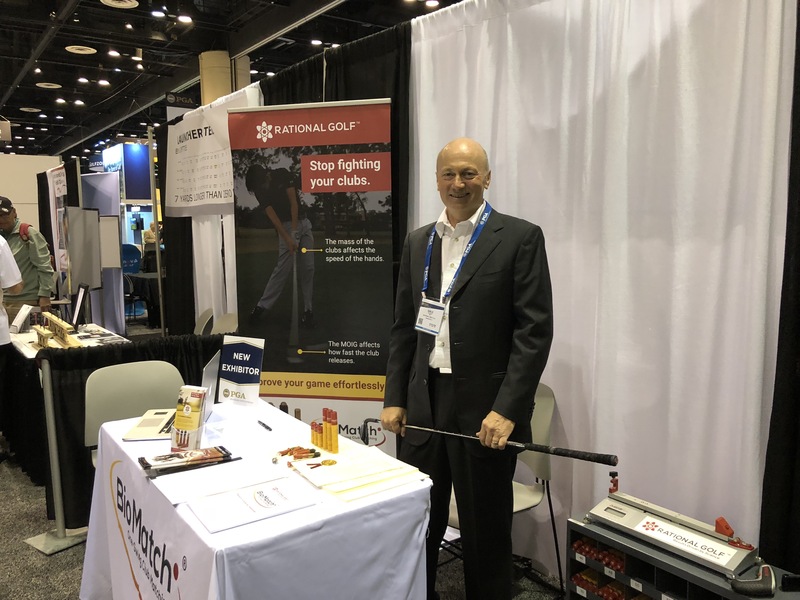 The Inventor of #BioMatch, Gisle Solhaug, presented his work on Scientific Matching of Golf Clubs as a Poster Presentation at the #WSCG2018. The WSCG brings together the leading minds in golf research to share their latest work as well as expose those findings to golf instructors and coaches in attendance. 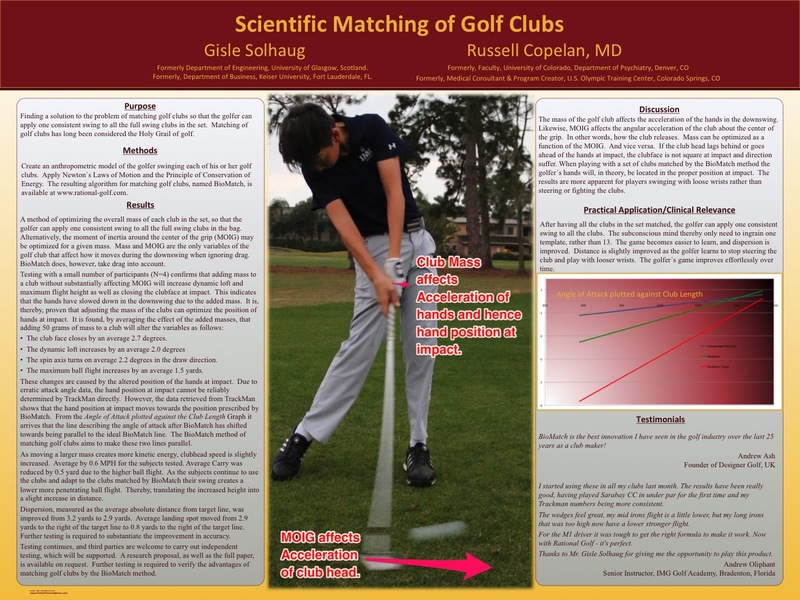 Gaining acceptance for the BioMatch method of matching golf clubs from the scientific community is crucial for successfully spreading the solution to all golfers around the world. The BioMatch method is confirmed to improve the golfer´s proficiency effortlessly. After a golfer has had his clubs altered by inserting a specific weight into the grip end of each of his or her clubs, one consistent swing can be applied to all the clubs in the set. BioMatch is shown to improve dispersion and consistency drastically. Gisle is currently working with other scientists on a more extensive research program for further substantiation of BioMatch that will be peer-reviewed and published. Hanging out with Sasho MacKenzie and the other golf scientist at the WSCG was a fantastic experience. It serves as an inspiration to continue my work on helping golfers improve their game through proper matching of golf clubs. 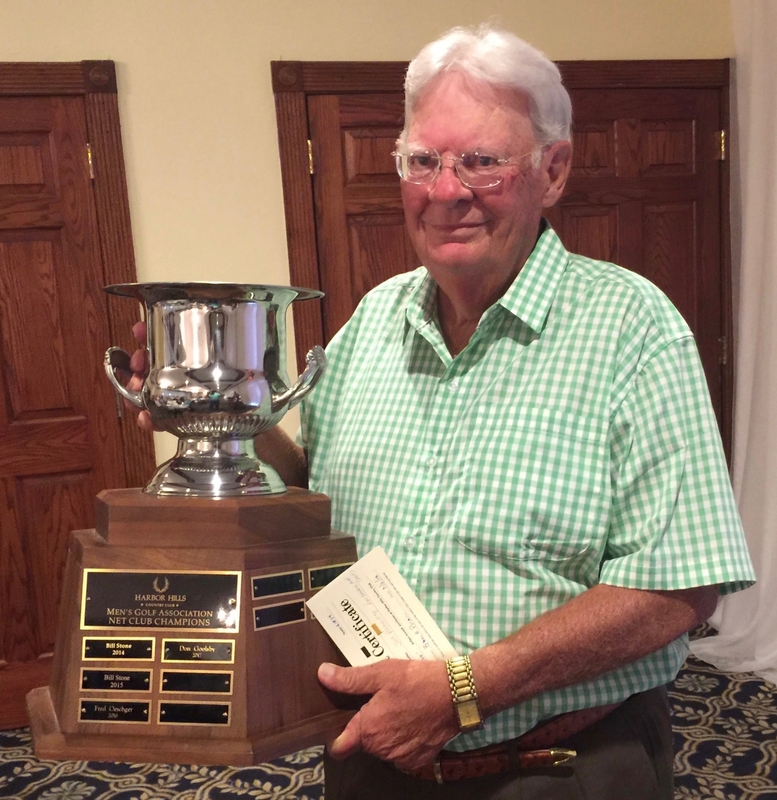 Joe Redoutey won the Club Championship and the President Cup at Harbor Hills Country Club, Florida. Joe, a 10 handicapper, shot a net score of 71, 68 and finished the third round with a strong 67. Congratulations! Joe is the owner of Brodie Golf, the club fitting shop located at Harbor Hills Country Club. Brodie Golf, https://www.joereddgolf.com, became a BioMatch Fitting Center about a month ago. Since then they have been doing on average two BioMatch fittings a day. All with great results. As the only Biomatch fitting center in the region, Brodie Golf is attracting a lot of customers. I guess Joe is shooting himself in the foot as he will receive stiffer competition next year from the players that he has matched the clubs for. Brodie Golf is also marketing their own complete range of golf clubs under the brand Joe Redd. Science and research are about questioning old beliefs, right? Since the beginning of club making golfers have tried to find a way of matching golf clubs so that they can apply the same consistent swing to all their clubs. Building a matched set of clubs is considered the Holy Grail of golf. Today golfers still use the 95-year-old method of Swingweight. Swingweight was made as an approximation to MOI around the center of the grip (MOIG), as there were no instruments readily available for measuring MOI at the time. Today this arbitrary method is entirely off target as shafts are no longer made of wood and shafts of various materials are mixed in a set of clubs. It should be evident to anyone with a slight knowledge of Newtonian physics that the properties that affect how a club moves when swung are Mass and MOIG. I have solved the problem of matching golf clubs. The solution is patented and is named BioMatch. I do not think I would have been able to solve the problem had I not been an outsider to the science of golf. As a mechanical engineer, I was able to solve the problem by considering conservation of energy. The Swingweight method is so ingrained in golfers at all levels that very few can imagine a world without Swingweight. Even golf scientists and professional golfers match their clubs by Swingweight. When I tell these people that there is a better way, I am met with disbelief. Last week I presented my solution to the 500-year-old problem under the Inventors Spotlight at the PGA Show. Some club fitters are signing up to take advantage of the new technology. However, one would imagine that the industry, in general, would pay some attention to such a breakthrough. Anyone that has tried the BioMatch method will tell you that it does wonders for their dispersion and game in general. It works. In an attempt to cut through the disbelief, I have written a paper on Scientific Matching of Golf Clubs. It is available on request. Independent testing has also proven the that the method works. However, a more scientific approach to testing is required to have my paper published. If anyone is interested in carrying out such a test, I have made a research proposal available on request. I would welcome any advice on how to move this forward. If you are at the PGA Show, you might want to stop by booth 3593. Rational Golf is presenting its BioMatch one swing club matching system. One consistent swing for all your clubs means better dispersion. 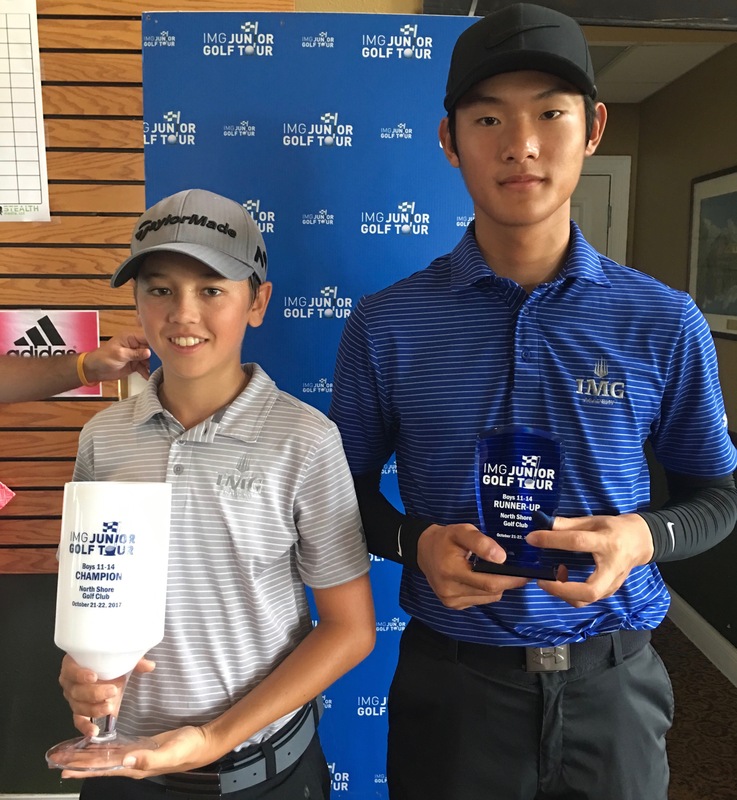 Angelina Ye, a 16-year-old student at the IMG Golf Academy won the AJGA Invitational at World Golf Village yesterday (January 15, 2018). She played the final round one under par to secure the victory. She is thereby qualified for Symetra Tour´s Florida´s Natural Charity Classic in March. Angelina is one of several players at the IMG Academy that is taking advantage of the BioMatch one-swing golf club matching system. Angelina had her clubs matched just two weeks before the tournament. She is a very talented and hard-working young lady that has already been accepted to Stanford University. Angelina appeared on the Morning Drive on the Golf Channel this morning together with Annika Sorenstam. She impressed everyone with her focus on both Academics and Golf. It will be very interesting to watch her progress. Gregory Solhaug (14) of Norway won the IMG Junior Tour at North Shore GC in Orlando this weekend (October 21- 22, 2017). Shang Huang (14) of China was leading by one shot after the first day. On the final day, Shang was hitting every fairway with long drives. He outdrove Gregory with an average of 70 yards. Although Gregory needed long irons and woods to reach the greens in regulation, he only missed one green in regulation. His approach shots were so accurate that he made three birdies on the last day and shot three under par. Winning the tournament by seven shots. It is more important where you put from than how good your putting is. Gregory´s clubs are matched by #BioMatch, which helps him shoot straight with every club. So far we have matched about 250 golfers with the revolutionary BioMatch system. Typically 20 handicappers start playing five strokes under their handicap after a few rounds of golf. We have fitted about twenty serious junior players; they all post better scores and do better in tournaments instantaneously. BioMatch is a computer application, available at www.rational-golf.com, which creates a model of your body swinging your clubs. It thereby determines the exact weight to be added to the grip end of each of your clubs for you to use the same swing for all your clubs. The tailored set of weights is specified in the BioMatch report and is then ready for order. After having the tailored BioMatch weights fitted in your shafts, you will notice a difference in how the clubs feel when you swing them. Before your first game with your “new” clubs, we suggest a session at the driving range to get a feel for how they swing. When hitting balls at the range try to relax your wrists and trust the clubs without trying to steer the club head. Some golfers will experience an instant improvement in ball striking. Others will only notice a slight improvement during the first round, but then continue to improve over time as the subconscious mind is getting used to only handling one swing rather than 13. Some golfers report that the clubs feel weird the first day, then the next day they cannot even feel that the weights are there. The overall mass of a golf club affects how fast the hands move in the downswing. The moment of inertia around the center of your grip (MOIG) of a golf club affects how quickly the club releases, or swings around the hands. Specifying and applying the correct ratio between MOIG and Mass of each club will match the clubs so that the hands will be in the proper position at impact. Once the golfer achieves a good swing with one club, the good swing will automatically transfer to every club in a set matched by BioMatch. That is how BioMatch makes you hit more fairways and greens and lower your scores. Click here to get started with BioMatch.